Alexander is back, as is Alexander. Worf’s son has come from the future to convince his younger self to down his prune juice and follow the way of the warrior. And if that doesn’t work, he’ll kill himself – in younger form. 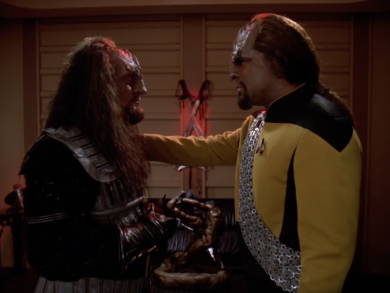 But older Alexander has a lot to learn from – hang on – a lot to learn from Worf, who may not be the worst father ever after all. It is Alexander as you have never seen him before: cool. Firstborn goes into this week’s Mission Log.